A nice petroglyph panel found along Roc Creek near the Dolores River in western Colorado. There was a small sign at the beginning of the trail to let you know you were in the right place. A view over the Dolores River and Highway 141 from the trail. 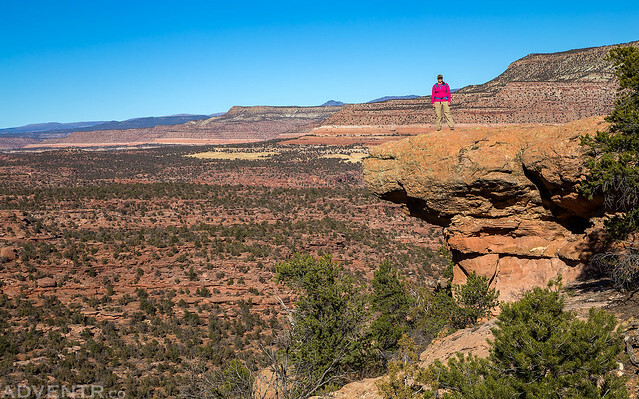 Diane checks out the view over Roc Creek Canyon. 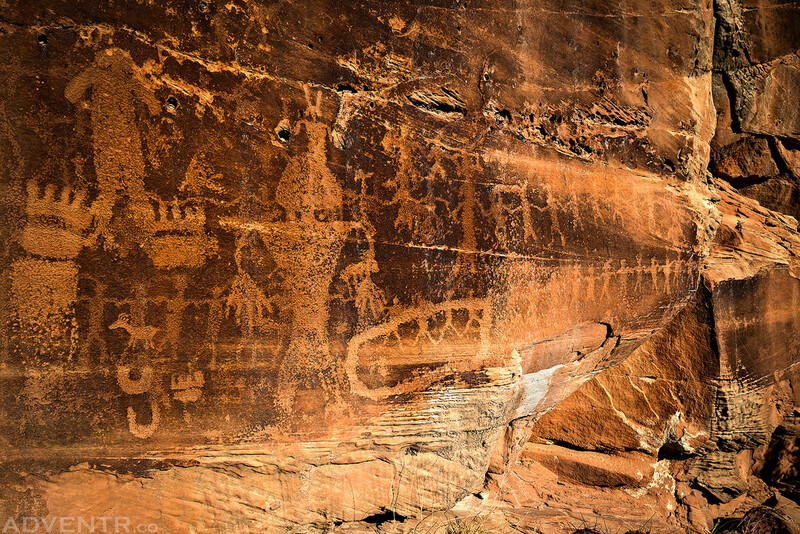 The main panel of petroglyphs along Roc Creek. Here are some closer views of the main panel. There were some other petroglyphs nearby, too. After hiking back down from the Roc Creek Petroglyphs, we visited another faint panel nearby along the Dolores River. While there were a number of petroglyphs at this location, most of them were difficult to see, let alone photograph. 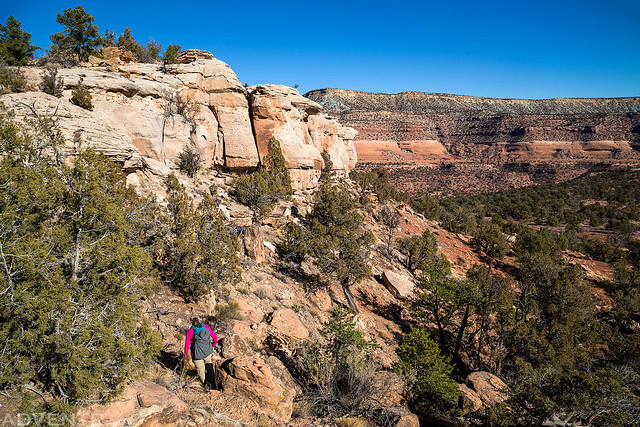 Next we drove back down the highway a little ways and hiked up the steep trail onto Sewemup Mesa which we explored for a little while and then climbed to the nearest high point for a view of the surrounding area. 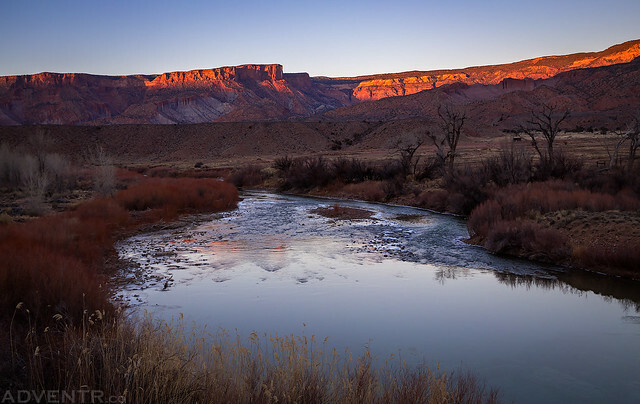 Sewemup Mesa is one of the rare ecologically pristine areas in western Colorado since it was isolated from development by its almost impassable belt of encircling sandstone cliffs. 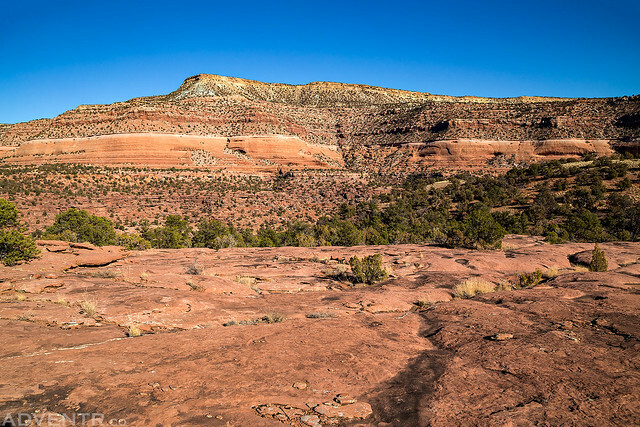 The legend of Sewemup Mesa began in the late 1800’s when a local cattle rustler would drive stolen cattle from Utah and Colorado up into the concealed pockets of the mesa where he would tie them down and cut out the piece of their hide containing the brand. Then he would then sew them back up with bailing wire and rawhide and wait for the wound to heal so they could be branded with the rustler’s own brand. The cows would then be put back on the range with the other cattle and nobody was any the wiser. 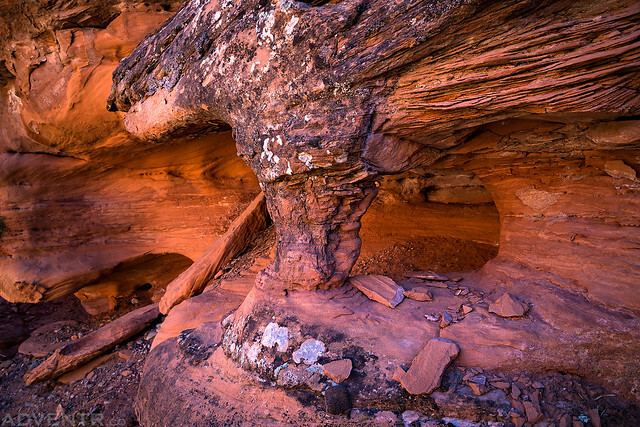 A small arch along the Sewemup Mesa Trail. 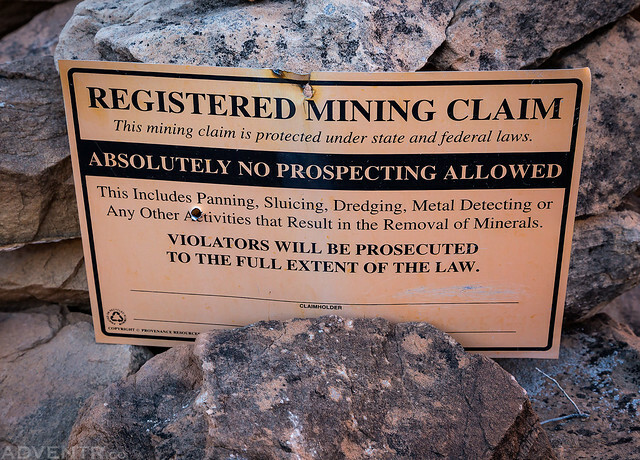 There is a mining claim located near the trailhead which has obliterated the beginning of the trail making it difficult to find at first, but once you get past that spot there are plenty of cairns marking this little-used trail up through the cliff bands. Diane stands on an overhanging ledge near the summit of the high point we climbed up to. 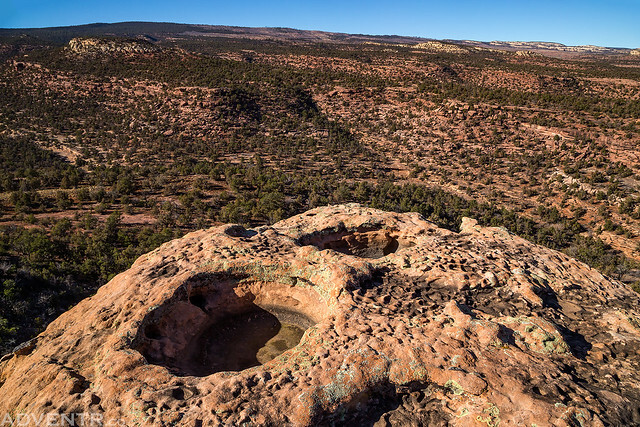 Large potholes and a view over Sewemup Mesa. Hiking back down from the high point. A view of Blue Mesa on the other side of the Dolores River Canyon as we hiked back down to the trailhead. 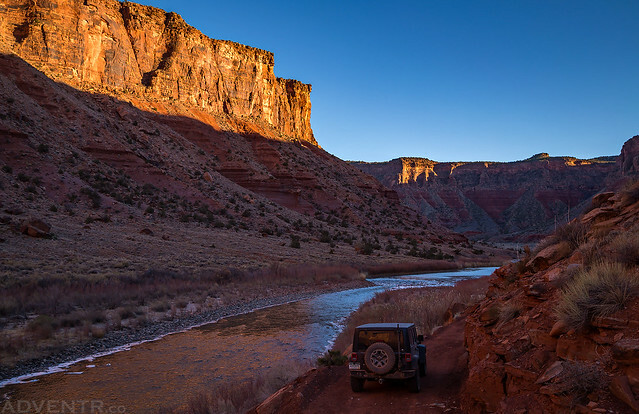 After returning to my Jeep we drove back to Gateway and searched along the Dolores River for another petroglyph panel that I’ve been trying to find for a while. I still had no luck finding it, but we did catch the sunset along the Dolores River before heading back home for the day. Driving along the Dolores River in Utah west of Gateway, Colorado. 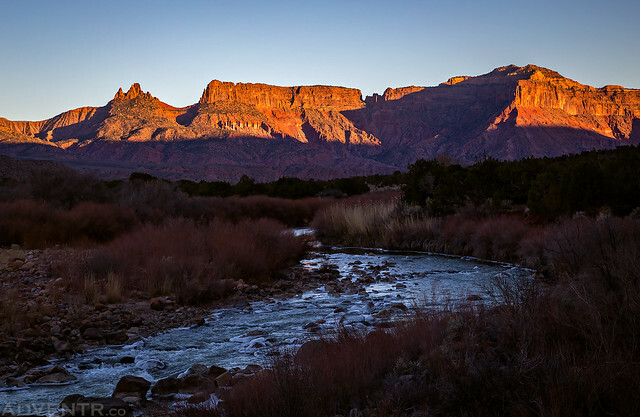 The last light of the day touches the top of the cliffs towering over the Dolores River. 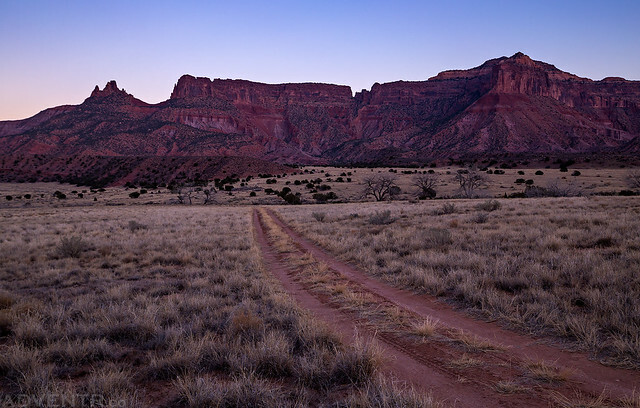 A two-track road heading off towards The Palisade at dusk. I always feel like I am getting a gift when your postings appear in my e–mail. Thanks again for your glyph and scenery photos. It is so interesting to see the differences in rock art from place to place. Happy wanderings! I will await more pics!